Stussy's Nike SB collabs set to launch this Friday. Stussy has teamed up with Nike SB for a brand new collab consisting of the Zoom Blazer Low & Zoom Blazer Mid. The two brands partnered numerous times during the 2000s, including SBs and Air Maxes, but it's been a while since we've seen them link on the Blazer silhouette. 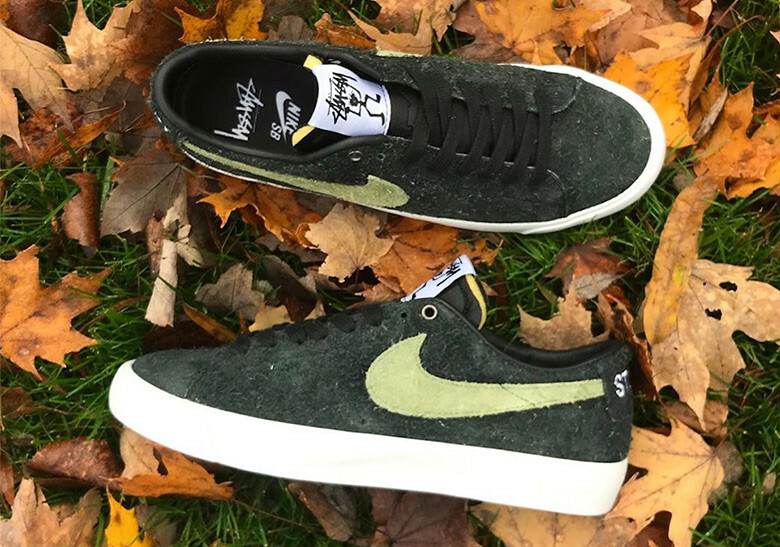 As seen in the photo below, the Stussy x Nike SB Blazer Low comes in a "Palm Green" nappy suede equipped with Stussy embroidery on the heel panels and custom Stussy artwork on the tongue. The Blazer Mid collab also features a fuzzy, distressed suede coming in light tan, accompanied by black laces and Nike Swooshes with Stussy's signature logo on the tongue. Additionally, the mid-cut rendition includes a DIY leopard print stencil that you can use to customize your pair. Both kicks are officially slated to release on Friday, December 7 at 7am ET via Stussy.com, Stussy Chapter Stores, DSM LA and London. Check out additional photos and video of the Stussy x Nike SB collabs in the IG posts embedded below.